Join more than 55,000 quilting enthusiasts for a full week of classes, exhibits, networking, shopping, guest speakers and more at the International Quilt Festival in George R. Brown Convention Center. Admission Tickets start at $9. Shop ‘till you drop at Houston’s highly-anticipated holiday shopping event, the annual Nutcracker Market at NRG Center. 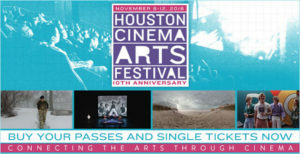 The Houston Ballet’s four-day market features more than 280 booths, offering unique gifts, home decor, gourmet foods, apparel, accessories and more. Admission Tickets are $20. Click here for more information. Sip champagne while shopping a selection of elegant daywear and eveningwear with couture-quality embellishment from the Toronto-based womenswear designer, Lucian Matis, who will stop by Uptown Parks’ Elizabeth Anthony boutique. Admission No cover. Click here for more information. Experience the best of Jewish literary, cultural, and performing arts throughout the forty-sixth annual Jewish Book & Arts Festival at Evelyn Rubenstein Jewish Community Center. The festival will feature book readings, discussions, film screenings, theatrical performances, concerts, and the Oliver Lapin Family Day. Admission Tickets start at $45. Click here for more information. Join the American Cancer Society Houston at Mercedes-Benz of Houston Greenway to celebrate the Real Men Wear Pink of Houston's 2018 campaign and candidates. Real Men Wear Pink gives men a leadership role in the fight against breast cancer. Admission Free to attend. Click here for more information. Get dolled up for dinner, drinks, and entertainment on the Sabine Street Bridge at the 2018 Buffalo Bayou Partnership Gala, which this year honors the contributions of Judy Nyquist and Geraldina Wise. Admission Tickets start at $1,500. Head to the Axelrad beer garden for a night of DJs spinning vintage latin and tropical rhythms on original vinyl. Admission No cover. Click here for more information. Blowing up over the summer, Kyle has made his mark on the scene with his May debut album, Light of Mine which includes his hit single "iSpy" with Lil Yachty. Marc E. Bassy and Tobi Lou open the show. Admission Tickets for this show range from $27.50 to $35. Cheer on your favorite queen at Drag It On, a 6-week drag competition where 13 contestants battle it out each week for the cash prize at Guava Lamp. Admission No cover. Click here for more information.